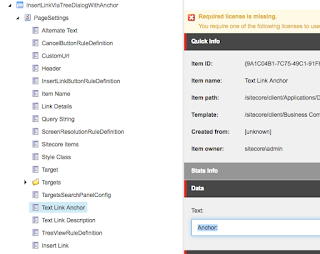 Think Sitecore: So where's the Anchor field gone? So where's the Anchor field gone? 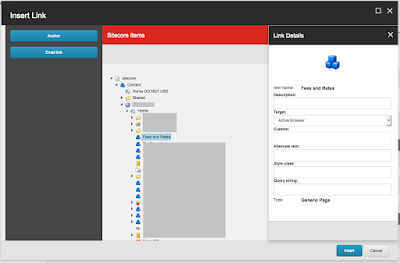 Since the introduction of Sitecore 8, clients have been asking where did the anchor field go? This blog entry applies to all versions of Sitecore 8 up to and including 8.1 update 3 (160519). 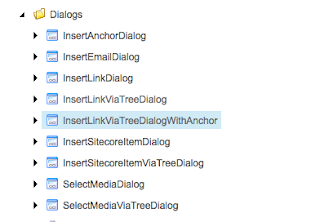 Although the XML generated by the link field still supports an anchor field, it looks like this has been dropped (or missed) from the insert link speak dialog. It looks like the all new speak layout for inserting a link doesn't have the field anymore. I felt that for cleanliness we should create a new layout rather than modify the existing. This means that should this issue get addressed in a later version of Sitecore or should new features be added to the dialog, the modifications we are making, will not impact the upgrade process. Also by doing it this way, it will be very easy to switch back (just update the speak config). N.B. Recommend that you do all of the of following in a development environment, and then package up the Sitecore items, js, and config, and deploy. This way you will not impact anyone else trying to work in Sitecore. 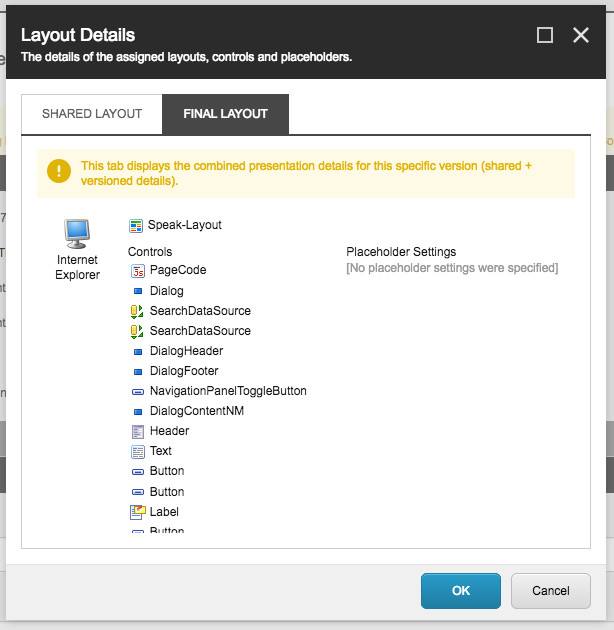 Firstly we need to navigate to the core database in Sitecore; go to the Sitecore dashboard and select the Desktop. Once you see the windows style desktop, locate the database icon (bottom right) click it, and select the core database from the popup menu. Right click this item and select Duplicate. In the naming dialog that appears give it a name like: InsertLinkViaTreeDialogWithAnchor. Select the newly created item and change the Text field's value to: Anchor:. Edit the raw values in the Renderings field. 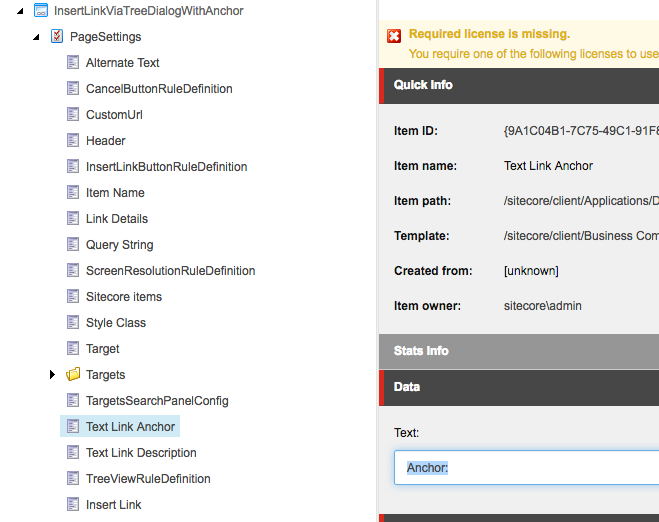 Navigate to the InsertLinkViaTreeDialogWithAnchor item in Sitecore and locate the Renderings field. Select the entire contents of the field, and copy to the clipboard. Open up Visual Studio and create a new XML file (Menu: File->New->File... XML File - then select open). In this example I will be placing the Anchor field directly after the Description field. ds="Item ID from your clipboard"
Once this is done copy the entire contents of the XML file in Visual Studio back into the Renderings Field in Sitecore for the InsertLinkViaTreeDialogWithAnchor item. Don't close down the XML file in Visual Studio, as we will be revisiting this in the future. In order to get Sitecore to map the value entered into the new anchor text box in the dialog, to the XML that is saved in the link field; we need to update what happens when the insert link button is clicked. This is done via a Sitecore RuleDefinition, which includes an Action. In this case the RuleDefinition we are interested in is called: InsertLinkRuleButtonDefintion. We need to update this rule to include a mapping for our anchor field. N.B You can follow the steps above and create an XML file in Visual Studio and paste the contents of this field into that file, to complete the next steps if you find it easier. Right click on this item and select Duplicate. In the naming dialog that appears give the item a name like: MakeInternalLinkFromTreeViewWithAnchor. N.B. Its important to realize that this name drives the name of the js file that will be used to do the mappings. We will need to use the same name when it comes to naming the js file. Update the value (guid) in the action element's id attribute to the one in your clipboard. Add an additional attribute to the action element as follows: targetAnchorID="Anchor"
N.B. If you gave your Action a different name use that instead. Line 5 - We've added the targetAnchorID variable. Line 63 - We've assign the text value stored in our targetAnchorID variable into the template mapper at the bottom. At the moment, if we were to jump to step 8 above and update the speak configuration to use our new layout it would all work in that it would add anchor text box value to the XML on click of the insert button, but it wouldn't populate the dialog with the anchor value if there was one set in the XML. To do this we need to update the code behind. Line 124 - On the last line of the ReadQueryParamsAndUpdatePlaceholders method we've assigned the value from the XML in the field to the Text parameter of our new Rendering property. We now need to update the PageCodeTypeName value in our Layout to use the new class. You should replace the Sitecore.Speak.Applications.InsertLinkDialogTree%2c+Sitecore.Speak.Applications entry with the full classname / library for your newly created class (remmeber to encode it). This step is only needed if you want to completely disconnect the new Layout from it's original. A data-source value - Not all the items need to be updated, some uses data-sources stored under the Settings item (at the same level as the Layout), buit the rest can be repointed to use those under this Layout. Use the Sitecore Rocks interface to navigate to the correct data-source for each rendering. RuleItemId - Again in the same way use Sitecore Rocks on the 3 remaining renderings that have a RuleItemId value in the par attribute to point them to the correct RuleDefinition. 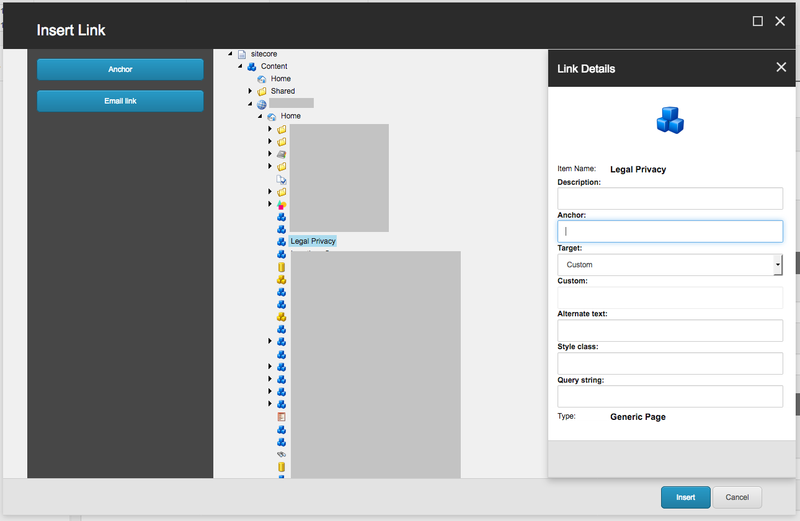 The final step is update the Sitecore.Speak.Applications.config file, so that Sitecore knows to use the new Layout. 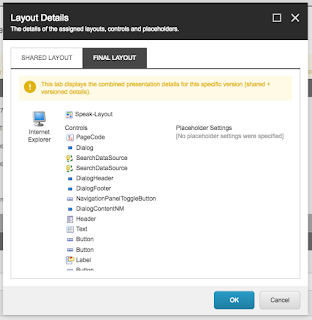 If you need to revert back, you can just undo the changes in the config and Sitecore will use the old layout. Deploy all of these changes and now you should have the anchor field added to your dialog! I will package up the change and attached to this blog at a later date. WebAPI - error message "An error has occurred."